Anyone waiting for a good deal on the Nexus S better pay attention as Best Buy has knocked $100 off the purchase price for a limited time. Of course, when we say limited we mean through March 23rd but what reason do you have to wait? Your local Best Buy doesn’t even need to carry T-Mobile since they can ship the Nexus S to you anyway! 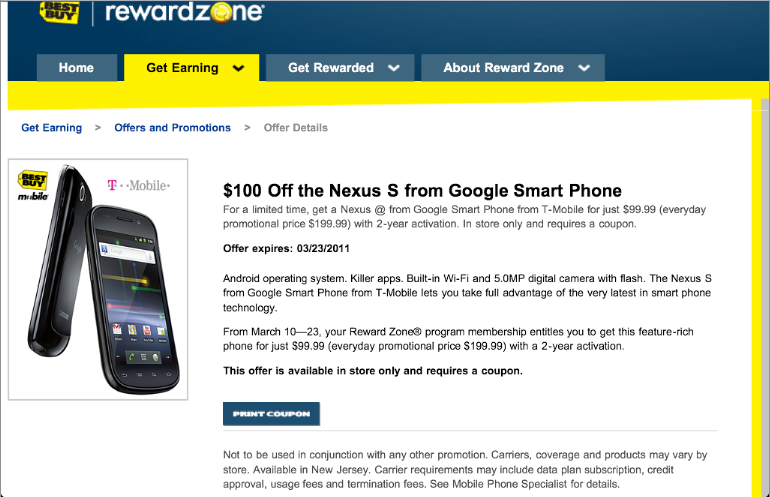 I should mention that it appears in order to qualify for this price you need to be a Reward Zone member. At least that’s what I’m gathering from the coupon details required to knock the price down. Let us know if anyone has any success without being a Reward Zone member! you HAVE to be a member, as soon as you click, it prompts you for a username and PW. I thought about buying it, hell I even printed out the coupon, but the fact that it has no SD slot, no LED Indicator (when you get a message of any kind) and no 720P video made me second guess…I’ll just hold out in hopes that the Pyramid is real. Altough it has FaceTime camera and runs on Gingerbread 2.3, I still like the Nexus One better. It just feels more solid in hand and more eye catching. The Nexus S looks a lot like other SamSUCK & galaxy S phones and a less than stellar build than its predecessor!! There is not facetime camera. Just a front-facing one. A facetime camera is just a camera on a device capable of using facetime. Which something that iPad, iPhone, iPod touch, and all Macs can do. Which is why Apple calls the new webcams on Macs Facetime cameras. Yeah I have the iPod Touch 4th g… and for some reason I call all devices with a FFC, facetime!! LOL but your right, thanks for the correction. Maybe in lou of a Nexus S 4G? clear inventory for new phones much ? Doesn’t the screen shot say in store only? Very interesting article! Read in one breath! Thank you! Write more such news! So this coupon is only good for 2yr contract extensions?? I wish this was available on the full price as well. So here’s the deal with the local stores I just talked to. One will only do outright purchase…no contract extension, and the other one I talked to said they do contract extensions, BUT if they did it that way, they’d have to ship the phone to me. Which I found a little strange, but that’s from their manager. If you buy it without a contract, I believe they’ll give you the phone right then and there. I’m perfectly happy with my service on TMo, and switching to another carrier will be more expensive per month, so it doesn’t bother me to sign a contract. I went to a local best buy but they told me they couldn’t take the coupon. If they did the paperwork, it would be the same as ordering off the website, as they have nowhere to enter the coupon code (same thing I came across when checking if this would work online). They didn’t have the phone in stock. I was sent to a best buy mobile, which was a small stand-alone type store inside of a mall (never seen these before) where they had the phone in stock. They were able to process the upgrade and accept the coupon, and all is well. If anyone else has any questions that I can try to clear up, LMK ;) I hope this helped. Oh, I forgot to mention (kind of off topic but worth mentioning) The blackberry data plan will not work on an android device. I got home and put in my BB Sim card, and when I tried to do anything with Data, I was brought to the page that said I needed a data plan. I called 611, and they straightened this out right away. I called my local store on Friday, and they weren’t familiar with the coupon. There’s also a BBY Mobile store in a mall nearby and this particular store said they sold the Nexus S at full value, but was not a T-mobile store, so they could not activate the phone. Sounds like this offer wasn’t communicated very well to the masses. BTW…the BBY’s I called were in San Bruno, Ca. That’s very odd….although this could just be Best buy being Best Buy. If you notice, I’ve gone to/ talked to 3 different stores (4 of you count the best buy mobile) and they all said something different. I guess it was worth it, I have a much wanted upgrade, and saved $100 on an awesome device. The BB Mobile I ended up going to was in the Lakewood City Mall.